Today I have some goodies for the kids Crazy soap have kindly donated a set of their crazy soaps. One lucky winner will get. 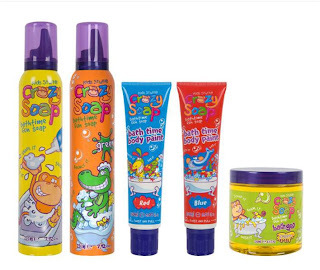 This a great prize so that the kids can have fun in the bath getting messy and cleans them all at the same time. To enter for a chance to win this competition just fill in the Rafflecopter form below. The giveaway will end on the 6th of December 2012 and will be drawn by Rafflecopter soon after. The winner will have 24 hours to contact me with their details. My kids would love the red body paint soap, they are little gore monsters and would love to try and convince me they were bleeding....tinkers! weve used them all, goo is a fave! Well i know my son would LOVE to try the paint!! Has to be the goo! I won't be trying any; if I am lucky enough to win, I will be donating the prize to charity, to go to Romania. sounds great fun lots of goo in the bath!! The paint sounds like good clean fun! I am intrigued by the goo.... as long as it gets them clean! The paint, we could paint pictures! My grandson would love it all but the foam he has not seen before. I'd try the body paint! My daughter would love them all. I will say the paint would be fun.. The red body paint sounds like fun! The goo sounds loads of fun!! The paint looks cool. My kids would have real fun with this.